In separate attacks a month apart, Islamist terrorists made it clear that they believed they acted in the name of their religion, exacting vengeance for their fellow Muslims. Yet several media pockets have gone into overdrive to deflect attention from that Islamist motivation. Still carrying the weapons that killed British soldier Lee James Rigby in his bloody hands, Michael Adebolajo explained why he attacked an unarmed man on a London street Wednesday: "We swear by Almighty Allah, we will never stop fighting you until you leave us alone. The only reasons we killed this man is because Muslims are dying daily. This British soldier is an eye for an eye, a tooth for a tooth. We apologize that woman had to see this today, but in our lands our women have to see the same. You people will never be safe. Remove your government. They don't care about you." The New York Times omitted reference to the attacker's invocation of Allah, relegating it to page A7. ABC, NBC and CBS similarly omitted the Islamic reference. Media Matters for America went further, accusing Fox News of "Islamophobia," for comments about the attackers' motivations. The liberal organization made no reference to the attackers' own words, but emphasized condemnations of the attack from British Muslim leaders. Commentator Michelle Malkin was singled out in the Media Matters post for saying the videotaped attacker was "quoting chapter and verse, sura and verse, from the Quran the justification for beheading an innocent solider there, and of course they've targeted civilians as well." In fact, that's exactly what Adebolajo did at 1:15 of the graphic video below. "But we are forced by the Qur'an, in Sura At-Tawba, through many ayah in the Qu'ran, we must fight them as they fight us," he says. Yet Media Matters cites Malkin's comments as an example of Fox's "Islamophobia." Following the Boston bombing last month, not even the discovery jihadist propaganda on Tamerlan Tsarnaev's YouTube channel and other social media platforms was enough to convince some media liberals that the he and his brother Dzhokhar were motivated by religion. Instead they chose to look for other more secular explanations such as Chechen nationalism or disillusionment with U.S. foreign policy. Hours after Tamerlan and Dzhokhar Tsarnaev's names became public, The Atlantic's Megan Garber penned a column titled "The Boston Bombers Were Muslim: So?" in which she suggested pinning the Muslim label on them reduced them to being "caricatures" and "whitewashed" their humanity. Had the bombers been white right-wing extremists like Timothy McVeigh chances are that Garber would not have called for tolerance and suggested using a label made them into "caricatures" or demeaned them. Not to be outdone, Media Matters' Eric Boehlert charged that Fox News was engaged in a "war on Islam," a conspiratorial, delusionary and incendiary narrative that Canadian intelligence says is the leading cause of radicalization among young Muslims. Boehlert has consistently ignored the treatment of women as second-class citizens and the imposition of the death penalty on homosexuals in Muslim countries such as Saudi Arabia, Sudan, Afghanistan and Iran. He has also routinely uncritically echoed the radical Islamist narrative pushed by the Council on American-Islamic Relations (CAIR), the Muslim Public Affairs Council (MPAC) and other groups. In turn, they have frequently cited his work in their own defense. The Media Matters senior fellow has defended Islamic extremists such as Sami Al-Arian, a Florida professor who pleaded guilty in 2006 of aiding the Palestinian Islamic Jihad terrorist group, accusing his detractors of "sloppy journalism" and of having a "pervasive anti-Arab bias." Boehlert also defended Islamic charities in a March 22 blog written after a biography about Fox CEO Roger Ailes showed that Ailes compared the charities to terrorist organizations. In fact, numerous Muslim charities have been shut down and prosecuted due to their support for terrorist groups. The Holy Land Foundation had been the largest Muslim charity in the United States before being convicted of routing more than $12 million to Hamas. According to a Foreign Policy magazine article published in February, the involvement of Islamic charities in terrorist fundraising continues. Boehlert refuses to use the term Islam and terrorism in the same sentence. Yet he had no such qualms about using the terms "right-wing" and "terrorist" in the same sentence following the Boston bombing to falsely describe Fox News's supposed inattention to white supremacist violence during an April 29 interview on Current TV. "When a right-wing nut, an extremist goes on shooting rampages, the response is how do they possibly stop a lunatic?" Boehlert said. "When a Muslim is accused of an act of terror, Fox News definitely knows how to stop the lunatic, and they are definitely interested in assigning political blame." This came six days after reports indicated that Dzhokhar Tsarnaev told his interrogators that he and his brother, as NBC reported, "were motivated by a desire to defend Islam because of 'the U.S. wars in Iraq and Afghanistan.'" That has since been reinforced by reports about Dzhokhar's note, scrawled inside the boat he was captured in on the night of April 19. "When you attack one Muslim, you attack all Muslims," he wrote. Boehlert has yet to acknowledge a religious motivation for the Boston bombings. MSNBC host Melissa Harris-Perry and her guests provided a compelling example of the contortions people will go to in order to minimize the radical Islamic connection to terrorist attacks in her April 21 broadcast. They took turns grasping at a serious of unrelated "what-ifs" that could have been in play. "I keep wondering if there will ever be a discussion of that this was because of Ben Affleck, a connection between Boston and movies about violence, and of course the answer is no!" Harris-Perry said. "But given that they are Chechen, given that they are literally Caucasian, our very sense of connection to them is this framed up notion of Islam making them into something that is non-normal." Georgetown sociology professor and MSNBC political analyst Eric Michael Dyson chimed into the discussion saying that the discussion of a religious motive following the Tsarnaevs' discovery was due to stereotyping and profiling. "We do what makes us the most comfortable that this is an exceptional, extraordinary case that happened because they are this," Dyson said. "So you take the one part of the element that he's Muslim. He might have listened to classical music … He might have gone to some lecturer." Peter Hart of the far-left Fairness & Accuracy in Reporting tore into Fox's Bill O'Reilly in an April 25 post for saying that "only radical Islam allows terror murder." "Islam, radical or otherwise, does no such thing–just as it would be wrong to blame Catholicism for O'Reilly's calls to attack civilians in several predominantly Muslim nations," Hart wrote, referring to his support O'Reilly's for the Bush administration's invasion of Afghanistan in 2001 after 9/11. FAIR has frequently been cited as the go-to source of media criticism by the Communist Party USA's news website People's World. It does not take long to read Osama bin Laden's 1998 fatwa calling it a duty for Muslims to kill Americans anywhere they can, or the Hamas Charter, to see that the terrorists do base their acts on Islamic religious texts. "Praise be to God, who … says in His Book: 'But when the forbidden months are past, then fight and slay the pagans wherever ye find them, seize them, beleaguer hem and lie in wait for them in every stratagem (of war),'" bin Laden wrote. "And peace be upon our Prophet, Muhammad Bin-'Abdullah, who said: 'I have been sent with the sword between my hands to ensure that no one but God is worshipped, God who put my livelihood under the shadow of my spear and who inflicts humiliation and scorn on those who disobey my orders.'" The opening paragraph of the Hamas charter invokes Surat Al-Imran (III), verses 109-111, before saying "Israel will rise and will remain erect until Islam eliminates it as it had eliminated its predecessors. The Islamic World is burning." Later, it cites Sura 2 (the Cow), verse 120, before declaring "There is no solution to the Palestinian problem except by Jihad." 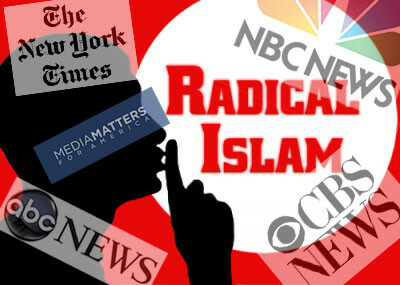 The media campaign to minimize radical Islam as a driver of terrorism is contradicted by at least two policy papers from non-conservative foreign policy think tanks. A 2010 report by the Bipartisan Policy Center found that the only common denominator for Muslim radicalization in America was a "religious fervor" that led them to justify violent behavior, and the Council on Foreign Relations found in a 2011 report that this thread has played out repeatedly in homegrown Islamic terrorists as diverse as Anwar al-Awlaki, Faisal Shahzad and Jose Padilla. Another reality is that many Muslim Brotherhood, Salafist and Wahhabist clerics who control Islamic religious institutions in the Muslim world as well as the West have openly rationalized "martyrdom operations" or "legitimate resistance" to justify terrorism. This has particularly been true with regard to terror attacks against Israel and the United States. "I encourage the Palestinians to… If only I, along with my brothers, my friends, and all the preachers, could go to that sacred land and die there as martyrs… Alas, it was not to be. Nevertheless, I encourage my brothers in Palestine to continue these wonderful, Jihadi, martyrdom operations," Sheikh Muhammad Musa Al-Sharif, assistant professor in the Department of Islamic Studies, King Abdul Aziz University, said in a Jan. 17 interview with Iqra TV that was translated by the Middle East Media Research Institute (MEMRI). Another noted example is Sheikh Yusuf Qaradawi, a Qatari-based Egyptian cleric who is touted by American Islamist groups including CAIR as a moderate. Following the 2003 U.S. invasion of Iraq, Qaradawi declared that Muslims who died fighting Americans in the Persian Gulf area would be considered "martyrs given their good intentions since they consider these invading troops an enemy within their territories but without their will." Qaradawi republished a fatwa on his website on earlier this month, originally written May 7, 2001 urging Muslims to engage in a jihad against their enemies. "There is no doubt that the Muslim is enjoined to wage jihad on the enemies of his religion and his homeland," Qaradawi wrote. "The Muslim does not take the infidel as a friend, and the pious does not take as a friend the impious, for if he takes him as a friend, it is evidence of a lack of faith, or the disappearance of his conversion to Islam, God forbid, for it is a kind of apostasy, and a type of defection from Islam. The Muslim if he cannot wage Jihad on his enemies with the sword, should then at least wage jihad on them by boycott." The unwillingness to recognize religion's role in these attacks by many in the media stems from a false belief that Muslims are victims in need of defense leads to a moral equivalency, according to Zuhdi Jasser, founder and president of the American Islamic Forum for Democracy. Jasser argues that the white supremacist narrative following the bombing stems from an acceptance by many liberals of the paranoid American Islamist narrative that Muslims are the victims of an imaginary plot to subjugate Islam. Many liberals in the media have also bought into the idea that the Muslim terrorists arrested since and Islamic charities closed by the government as fronts for terrorist groups in the wake of 9/11 were framed by the government. Another false belief is that Muslims have been the predominant victims of religiously motivated hate crimes since 9/11. Hate crimes against Muslims have fallen dramatically since 2001, when Muslims accounted for 26.3 percent of all hate crimes targeting religion. In 2011, that number stood at 13.3 percent, according to FBI statistics. By contrast, the same statistics show that hate crimes against Jews accounted for 57 percent of all religiously motivated hate crimes in 2001 and 62 percent in 2011. Jasser argues that politics feeds the white supremacist narrative and jihad denial of many media figures. "This is part of a growing meme of thou shalt not be critical of minorities," Jasser said. "Those who refuse to acknowledge that while not all Muslims are Islamists, all Islamists are Muslim are in denial. That denial can be manifested many ways in order to deflect debate and genuine critique or reform." Jasser charges that accusations from media figures fuel Islamist efforts to sow alienation and hatred of the West. That makes young Muslims susceptible to al-Qaida's message, as the Tsarnaev case shows. "The Atlantic's Megan Garber penned a column titled "The Boston Bombers Were Muslim: So?"" Any chance in hell the Atlantic would have published a column entitled "The Boston Bombers were Tea Partiers: So?" Anyone that has read The American Muslim Alliance Toolkit published especially for the 2008 Presidential Election can quickly understand how Islam has a firm foundation in American Politics. The Toolkit Title, 'Beyond The ABC of American Politics' reveals exactly how Barack Obama and others have risen to high places of power in all aspects of American Life; Mainstream Media, The U.S. Congress and all Departments of Government including Education, Law Enforcement, The Military and elsewhere. The Toolkit's basic formula along with The Muslim Brotherhood Memorandum published in 1991 clearly exposes an Islamic Agenda whereby historic American Values, Ideals, and even The U.S. Constitution are being replaced by Political Correctness. Right under the noses of the American people the impact of Islam has quietly compromised freedom itself. The aforementioned publications were prepared by Muslims intended for Muslims. Thus, by simply reading these documents, any American can know the stupidity of trying to separate the good muslims from the bad muslims is a waste of time. No Muslim will ever even begin to think of conforming or assimilating to any national set of rules in any social setting that conflicts with Mohammad's Qur'an. To believe otherwise is for morans, idiots, and outright fools. Jasser's comments about "white supremacist narrative" don't make any sense. Why doesn't Jasser help us to understand where the jihadist ideology comes from? Why doesn't he deal with those verses from the Koran which the Moslem terrorists always cite, one of which is cited in this article? Since Jasser claims to be a devout Muslim, he needs to deal with these verses of the Koran instead of pretending they don't exist. The reason why the liberal/left will not acknowledge that Islam is at the root of these terrorist attacks is that there is an unspoken, almost Freudian symbiosis felt by the liberal/left with Islam, that is, a grudging empathy for another totalitarian system. The Progressive Movement, spawned in the late 19th century, made great strides in the 20th with the steady passage of laws that increasingly robbed men of their freedom from arbitrary, fiat law and regulation, until today when there is hardly a human action or product that is not regulated or constrained. This covers a range of law from the Income Tax Amendment to mandated nutritional information on food packaging and countless measures in between. The Progressives – aka socialists – see Islam, with its head-to-foot regulation of Muslim behavior and existence, as a friend and ally that will help to vanquish capitalism and Western civilization. That is their mutual end. "Moderate" Muslims such as Zuhdi Jasser believe Western precepts of law and freedom can be reconciled with Islam. This is delusional. They cannot. If Islam is doctrinally a totalitarian ideology, it cannot and will not be reconciled with individual rights. Capitalism and freedom do not sanction or advocate the forcible conquest of socialists and collectivists, unless the latter initiate force against the former. Islam and Progressivism do sanction and advocate the initiation of force.